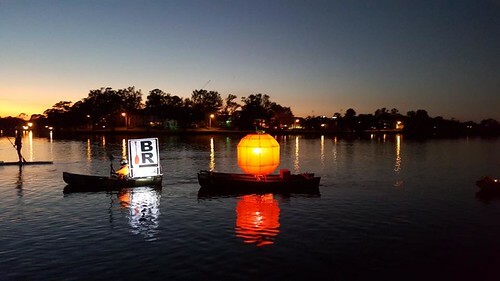 The last of the exceedingly alliterative October events with BREC Outdoor Adventure was Thursday, and the Pumpkin Paddle Parade was exceptional as always. After last weekend’s epic rainfall totals, there was going to be no problem with the water being too low this time. Earlier in the week, the lake reached clear across the boat launch and well into the parking lot. By Thursday evening, it had receded right to the top of the bank, leaving near perfect conditions for launching and recovering at Wampold Park. By five, people were arriving and decorating their boats. Image courtesy of BREC. Click for more early photos. We all headed off for the paddle parade part a few minutes after six. 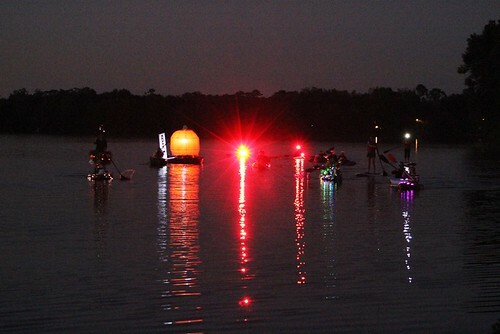 The creativity on display on the various paddleboards, kayaks, and canoes was even better than last year. Also, the winds were virtually calm, which made me happy. Towing the Great Pumpkin has never been so relaxing. It was an easy paddle up the lake and back. Image courtesy of BREC. Click for the complete, fantastic photo album. If you haven’t come out for a Pumpkin Paddle Parade, you should definitely try to make next year’s. It’s getting bigger every year. (This year there was a distinct increase in the number of spectators on land at the park, too.) We’ll be there next year, of course, and we’ll have to do even more upgrades to PaddleBR’s Great Pumpkin — got to try to keep the awards streak alive, after all. Last year was the first showing of the Great Pumpkin. This year built an “electronic candle” to improve the lighting (very brief video clip below). Who knows what next year will bring? 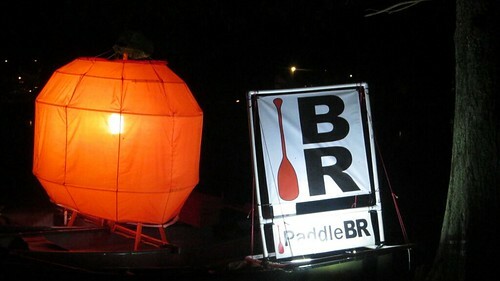 ← Pumpkin Paddle Parade this Thursday!